An astonishing one in every seven Americans ages 16 to 24 is neither working nor in school—5.8 million young people in all. As their peers lay the foundation for a productive, fulfilling adulthood, these disconnected youth find themselves adrift at society’s margins, unmoored from the structures that confer knowledge, skills, identity, and purpose. The cost is high for affected individuals—and for society as a whole. Lack of attachment to the anchor institutions of school or work at this stage of life can leave scars that last a lifetime, affecting everything from earnings and financial independence to physical and mental health and even marital prospects. And last year alone, youth disconnection cost taxpayers $93.7 billion in government support and lost tax revenue. Big gaps separate major metro areas; in bottom-ranked Phoenix, 19 percent of young people are disconnected from the worlds of work and school, whereas in Boston, which tops the chart, only about 9 percent are. African American young people have the highest rate of youth disconnection, 22.5 percent nationally. In Pittsburgh, Seattle, Detroit, and Phoenix, more than one in four African American young people are disconnected. Young men are slightly more likely to be disconnected than young women, a reversal of the situation found in decades past. The situation varies by race and ethnicity, however. The gender gap is largest among African Americans; nationally, 26 percent of African American male youth are disconnected, compared to 19 percent of their female counterparts. Youth disconnection mirrors adult disconnection: household poverty rates and the employment and educational status of adults in a community are strongly associated with youth disconnection. Where a young person lives is highly predictive of his or her likelihood of disconnection. 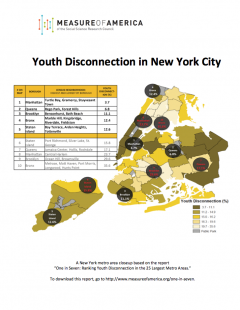 The findings break down youth disconnection by neighborhoods within cities. The disparities between wealthy and poor communities are striking. For example, in New York, disconnection rates range from 3.7 percent in parts of Long Island to 35.6 percent in parts of the South Bronx. The report concludes with a set of recommendations for preventing youth disconnection, including moving beyond the “college-for-all” mantra to provide meaningful support and guidance both to young people aiming for a four-year bachelor’s degree and to those whose interests and career aspirations would be better served by relevant, high-quality career and technical education certificates and associate’s degrees.